Dishwasher Safe Cat Saucer. Purrrrrrfect for Milk & Cream. Stainless Steel Bowl. Can be used for Food & Water. Material: Stainless Steel. Colour: Silver. Help us to help you and others! Give us the chance to correct it! Mimi Cat Bowl. Design: Mimi. 0.3 Litre Bowl. Material: Ceramic. Help us to help you and others! Give us the chance to correct it! Can be used for food or water. We make Handmade Pet Toys As well we have been making them for over 25 years. 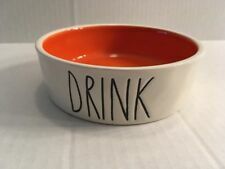 Trixie Ceramic Cat Feeding/Drinking Bowl ---Available in Orange, Lilac or Green, Colours sent at random unless message is sent stating preferred colour. ---0.2 l ø 13 cm. Sass & Belle "I'm A Cat, Whats Your Superpower" Bowl. Perfect gift for cat lovers. Capacity - 16 fl oz. We're rated 5/5 for service! Not suitable for Microwave use. Excellent Prices. High quality products at amazing prices. New Trixie Ceramic Food / Water Cat Bowl - 4007 ---Ceramic cat bowl with funny motif ---bowl holds 200 ml 11,5 cm in diameter. ---Easy to clean bowl. Stainless Steel cat bowl ---Stainless Steel ---With plastic coating ---Non slip base ---0.3 l stainless steel cat bowl with attractive plastic coating on the outside. Colours vary. 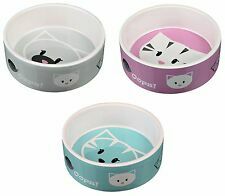 Trixie - Ceramic Food / Water Cat Bowl ---Delightful cat bowl ---11cm diameter, 250ml ---Colours vary. Trixie Ceramic Cat bowl ---3 different motifs random sending ---200ml / 11.5cm ---Ceramic ---These ceramic bowls are easy to clean and have an ideal size. 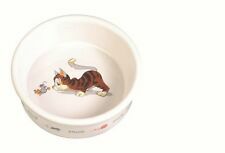 Katzy Kraft Cat Shaped Interactive Slow Feeding Bowl - The best price, the best quality and features. WHISKER CITY CAT BOWL. The features of the face are also raised and can be used to also slow down feeding. 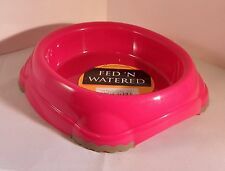 Fresh Fruits Ceramic Bowl for Dogs or Cats Food Water Dish 0.8L 16 cm Posted TODAY if paid before 1PM! Approx Size: 16cm (6.5") 0.8 Litre Bowl Material: Ceramic Dishwasher Proof Design: Fresh Fruits. This a brand new/unused adorable Cat Faces bowl by Signature. Continuous pattern of cat faces on the outside and gorgeous cat outline inside the center, perfect for a water bowl, so you'll still be able to admire the beauty of this bowl. Main colors are grey and mint green on a white background. Bowl has 5" diameter and about 1.5" deep. Holds approx. 1 cup liquid. This Stoneware bowl is dishwasher and Microwave Safe. Check out some of my other items up for sale that make great Christmas gifts. Thanks for stopping by. Rae Dunn Cat Kitty Bowls Set Of 2 Meow & Purr Magenta Artisan Collection New! Rae Dunn Cat Bowl Meow, Purr, Savor Or Sip. Your Choice Ivory, Blue, Gray. New. Sturdy Ceramic Cat Bowl. Sturdy Design. Sturdy Design and well balanced so wont tip over. Made from Matt Ceramic. 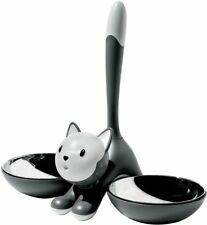 Cute cat food or water dish, bowl. New never used. Approx Size: 13cm (5"). With Cat Silhouette. Ceramic Cat Bowl. Ceramic Bowl for Cats & Kittens. Help us to help you and others! Give us the chance to correct it! Phrase states: "I'm a Cat. What's your superpower". Made from top quality stoneware ensuring its durability. Koziol Miaou Cat Dish - White. Beautiful Koziol Cat Bowl with a kitten on the rim of the bowl and three rubber legs on the base. Features: Koziol Miaou cat bowl. Colour: white. Made from food safe plastic. Measures approx. 16 x 16 x 4cm. Manufactured in Germany by Koziol. 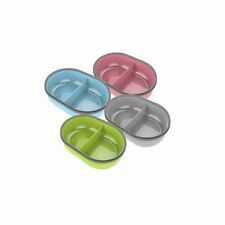 Blue Small Interactive Slow Feed Cat Food Bowl FUN, No-slip, No bloat, USA Ship!